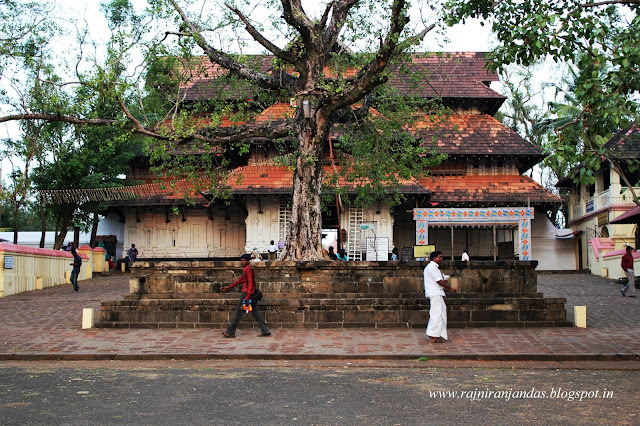 Tales Of A Nomad: Vadakkumnathan Temple...!! 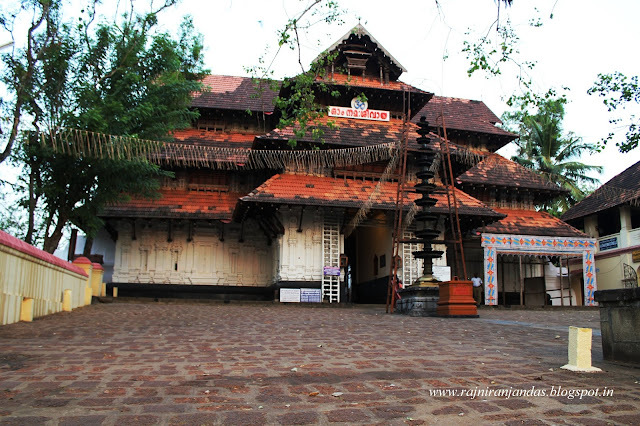 Situated at the centre of Thrissur town, this quintessential Kerala temple is the abode of Lord Shiva and has one of the largest temple complexes in the state. Wonderful architectures and mural paintings make Vadakkumnathan the epitome of Kerala temples. Thrissur pooram, which is one of the biggest temple festivals in Kerala is conducted within its premises. The temple is very well maintained and its peaceful environment is sure to leave you spellbound for long. Chirping of the birds and Shiva chants are the only audible decibels. Signing Note- Undoubtedly one of the most serene temples in the country...!! Were you not allowed to click the pics inside the temple.. This place looks calm. The hut type architecture looks old,classy and antique. Needless to say that I want to have the darshan of deity also. Kerala is on hit list. lets see when Lord calls. Nice clicks. Thanks Vishal. It is definitely a must visit temple. The serenity lies inside the huge complex. Cameras arent allowed, so couldnt capture them. Though Ive been to Thrissoorpuram some 15 years ago, I haven't been to this temple yet. Keep planning to go to the pooram every year, but it never works out. Hopefully next year. It is a must visit temple! I was there after 12 long years. Love this temple. One of my favourite. I love the temples of Kerala and their ambiance. Havent experienced that calmness in temples outside. It is beautiful! Stone walls and tiled roof, amazing architecture! I hear there are murals of Mahabharatha scenes inside. Abode of Lord indeed. It indeed has awesome architecture. Yes, the murals of Mahabharata are there inside the premises. What a grand structure and you have captured it well. I like tiled-roof structures, they have their own charm. Lovely shots! Interesting architecture! Temples in India have different peculiarities, which remains untouched. It's really good to be able to almost be there through the photographs. Can imagine how nice it would be to walk on the old stone flooring and as you say, to hear nothing other than the birds and the shiva chants. It is a must visit temple. Make it the next time. Looks so very peaceful and calm. Would sure love to get the feel in person someday. Wonderful post, Niranjan! Thanks Arti. Do visit when you are in Kerala next time. Indeed a grt place in the heart of the city. I have done my engineering in Thrissur. And this has always been a place there that fascinated me. Great shots Niranjan. It's really hard to imagine that this temple is located right in the center of Thrissur town. Once you enter into that 'gopuravaathil', you get lost in the different emotions - be it religious or aesthetical. During Thrissur Pooram you can take your cameras inside the temple premises (not inside the sanctum) but around the pradakshina path and ilanjithara. Thank you. I just love the ambiance inside. You can easily get lost to the chants and the serenity. It has been ages since I saw the Thrissur pooram. Nice photographs. I had been there recently. It is said that originally it was a Jain temple dedicated to Vrishabha. Thank you. Now that is an interesting information. Did not know about that fact.